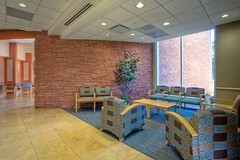 Best Medical Project Arizona, Banner Page Hospital Expansion | Guthrie General, Inc. 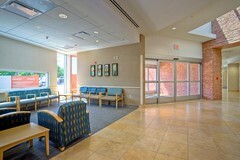 The Banner Page Hospital Expansion included a 9-bed, 10,000 SF emergency department addition with six treatment bays, three trauma bays and a hospital entry. 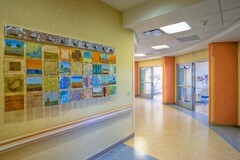 Banner Page desired a design where the hospital staff could have unobstructed visibility into each of their patient’s rooms, to which the design team provided a solution derived from the geometries and proportions of the nautilus shell, a naturally occurring fossil in the region and a symbol of the Native American religious beliefs. 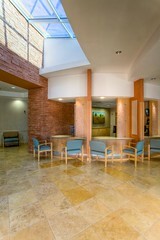 Good healthcare design promotes a healing environment, which is inherently related to environmental awareness. Banner Page engaged in several sustainable practices including the use of non-toxic paint, local materials, and sustainable design through the capitalization of natural light. Additionally, one exam room was left unfurnished, so that Banner Page Hospital could gauge their needs and outfit the space according to their required usage.